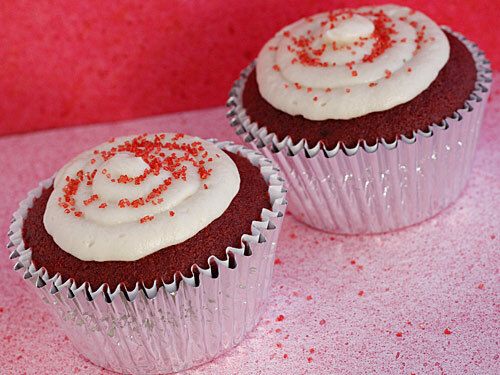 Red Velvet Cake is my weakness and I can’t think of a better cake to eat on Valentine’s Day. Topped with low fat cream cheese frosting you wouldn’t even know these are light. Perfect for Valentine’s Day or birthday parties. A few other Valentine’s Day recipes I love making for the occasion are Homemade Chocolate Cake, Mixed Berry Pie, Vanilla Bean Panna Cotta and Chocolate Crepes with Strawberries. 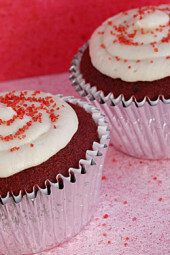 You can also check out this full list of Valentine’s Day recipes. My 16 year old daughter (she’s the baker in my house) made her red velvet cupcakes are amazing! I made it my mission this week to make a skinnier version of them for this week’s post. It’s always a challenge to lower the fat in baking so when these came out of the oven (fingers were crossed the whole time) I was so happy to see perfectly baked cupcakes. Topped with low fat cream cheese frosting you wouldn’t even know these are light. In another large bowl beat sugar, applesauce and butter. Cool, then frost with low fat cream cheese frosting. Beat together cream cheese, powdered sugar and vanilla until smooth.